Whether or not to vaccinate your child has become an emotional topic over the past several years. Media reports that vaccinations are dangerous are widespread, and it's difficult to sort through the vast amount of information out there and figure out what's truth and what's fiction. Furthermore, it can be daunting when you arrive at the doctor's office and find out that your baby needs five shots for her routine checkup. I approach the topic of vaccines as a scientist: How do they work, are they effective, are they safe and how do we know? Children are born with a full immune system. When an unknown bacteria or virus is discovered by the immune system, the body produces antibodies to help protect against future invasions by the same invader. The human body is capable of making thousands of antibodies. Vaccines are dead or greatly weakened parts of viruses or bacteria. When your child gets a vaccine, the body makes antibodies, so that if your child is exposed to the virus or bacteria at a later date, the body can fight it before getting sick. Through vaccines, your child becomes protected from the disease without ever getting the illness. Vaccines are clearly effective. They have saved the lives of millions of children around the world. Because of vaccinations, we rarely see polio, tetanus, pertussis (whooping cough), measles, mumps and even chicken pox in children anymore. Rates of hospitalization in children have dropped dramatically in the past 20 years because of the use of vaccines. That being said, they are not always 100 percent effective in every child. Many vaccines require two to three rounds before they protect your child from disease. Usually, though, if your child does get sick, it's a less serious version of the disease. We see this with the chicken pox and zoster vaccines. The most common question I get from parents is, "Are vaccines safe?" In general, vaccines are extremely safe. Vaccines undergo testing for 10 years or more before they are made public. Once in use, vaccines are continually monitored for safety and effectiveness. However, like any medication, vaccines can cause side effects. The most common side effects are fever or soreness at the sight of the shot. Severe reactions are possible, but are very uncommon. Some families worry that vaccines containing mercury and thimerosal can cause autism. Research to prove or disprove a possible relationship between thimerosal and autism is ongoing. However, to date, no scientific linkage has been established. In fact, the original suggestion of autism-associated vaccination came from scientist Andrew Wakefield, whose study of 12 children has been invalidated and disproved by the scientific community. Unfortunately, it started a frenzy of media activity that has placed doubt in the public's mind about the safety of vaccination. Others might worry that giving too many vaccines might overwhelm the immune system. However, the infant immune system can respond to many antigens simultaneously. Several studies have validated this claim, and it's even safe to give vaccines with a concurrent mild illness. When families come to me with concerns about vaccinations, I try to identify what bothers them the most. Many times, education and answering questions about fears help to alleviate anxiety. Sometimes at a parent's request we will provide alternate schedules to break up the shots. However, this is not necessary, and can lead to increased number of shots and doctor visits. In 2008, Idaho had the lowest vaccination rate in the country at 60 percent. Over the past few years, the state has been making efforts to improve this, and as of 2010, the rate had improved to 70 percent. This means that 30 percent of our children are not vaccinated, and therefore are at risk of contracting disease and being hospitalized. Due to increased immigration and intercontinental movement, the diseases we have not seen in years are on the rise, including polio, measles and pertussis. For more information visit http://www.cdc.gov/vaccines. 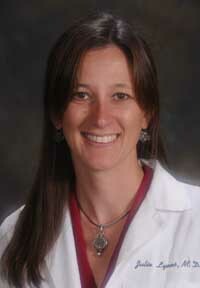 Dr. Julie Lyons is board certified in family medicine. She sees patients at St. Luke's Clinic—Family Medicine in Hailey.